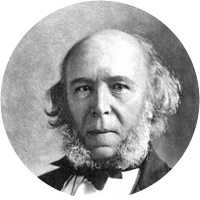 A collection of the best Herbert Spencer quotations. Morality knows nothing of geographical boundaries or distinctions of race. Progress... is not an accident, but a necessity.....it is a part of nature. Only when genius is married to science can the biggest results be produced. Time: that which man is always trying to kill but which ends in killing him. Not education, but character, is a man's greatest need and a man's greatest safeguard. In science, the important thing is to modify and change one's ideas as science advances. Architecture, sculpture, painting, music, and poetry, may truly be called the efflorescence of civilized life. No man can be perfectly free till all are free; no man can be perfectly moral till all are moral; no man can be perfectly happy till all are happy. What now is the most important attribute of man as a moral being? May we not answer—the faculty of self-control? This it is which forms a chief distinction between the human being and the brute.